Horizon Pharma – the manufacturer of three extremely expensive drugs – Vimovo, Duexis and Pennsaid – just released its Quarterly Earnings Report causing its stock to plummet. The Report should also cause every Plan to stop providing coverage for these 3 drugs and to stop relying on its PBM’s “standard” Formulary. Read on, and we’ll explain why. Horizon’s Vimovo and Duexis can best be described as “combo convenience drugs”. Each drug combines two drugs that are over-the-counter. Vimovo is a combination of (i) naproxen (Aleve), and (ii) esomeprazole (the generic for Nexium). Duexis is a combination of (i) ibuprofen (the generic for Advil or Motrin), and (ii) famotidine (the generic for Pepcid). The theory behind each drug is that it’s convenient for users to combine the products, because Aleve and Advil and Motrin sometimes cause stomach irritation, and Nexium and Pepcid can reduce stomach acid to prevent that result. The usefulness of Horizon’s Pennsaid is similarly questionable, and its pricing similarly outrageous. Pennsaid is a topical treatment that individuals can rub into their knees to reduce pain from arthritis. But its efficacy is limited, and it costs approximately $1,500 for a 30 day prescription. Horizon – and PBMs – will undoubtedly claim that the above three prices are inaccurate, because Horizon provides “rebates” to PBMs, and PBMs pass through those “rebates” to their clients. But neither Horizon – nor PBMs – will disclose exactly how much Horizon provides in rebates on any of these drugs (or any other drugs for that matter). And PBMs refuse to disclose how much in “rebates” the PBMs actually pass through on each of these drugs (or any other drugs for that matter). Everyone is supposed to “just trust them”! Put bluntly, any such trust is entirely misplaced. PBMs would need to pass through rebates of almost 100% to bring down the cost of any of these 3 drugs to the cost of their alternative over-the-counter products. While Vimovo costs about $2,200 and Duexis about $1,500 per 30 day treatment, patients can separately purchase over-the-counter Aleve and Nexium – or over-the-counter Advil (or Motrin) and Pepcid – for about $20 and combine the drugs themselves to obtain the same therapeutic result as Vimovo and Duexis provide. Similarly, patients can easily replace Pennsaid (at about $1,500) with very low-cost over-the-counter topical pain relievers, like voltaren gel (for about $13). Tellingly, the per pill AWP of Vimovo and Duexis – and per milliliter AWP of Pennsaid – has also relentlessly increased during the past 5 years, as reflected in the Chart below. 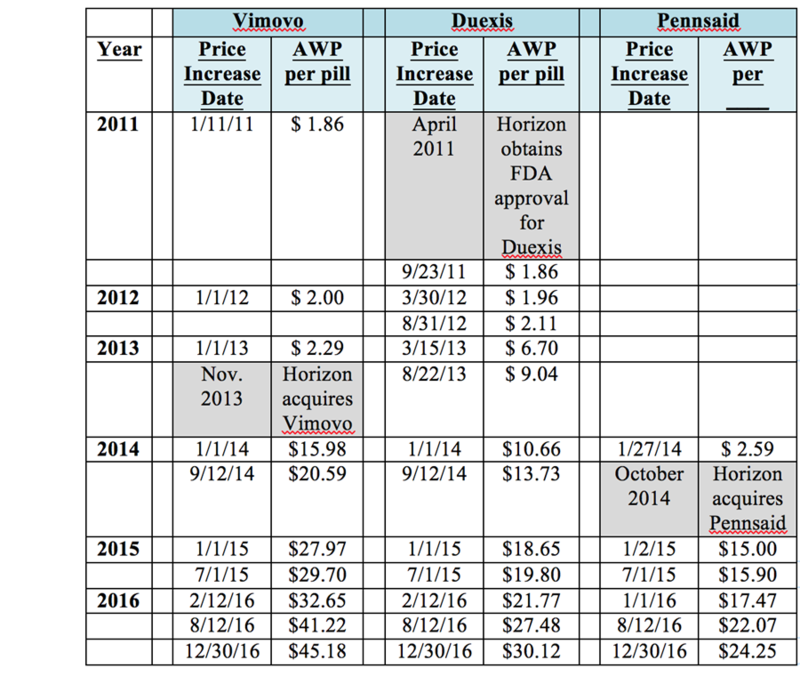 Note, too, how Horizon drastically increased Vimovo’s and Pennsaid’s prices after acquiring each of these drugs. So Why Are PBMs Covering These Drugs? Given the questionable value of these drugs – and their inflated and ever-increasing price tags – every Plan should be asking why any PBM included any of these drugs on the PBM’s “standard” Formulary in 2017. That’s a particularly obvious question since several PBMs (including the two largest – Express Scripts and Caremark) dropped coverage of these drugs in 2015 and 2016, excluded scores of other drugs from their Formularies in 2017, but chose to add these drugs back into their Formularies in 2017. The answer of course is simple: Money. 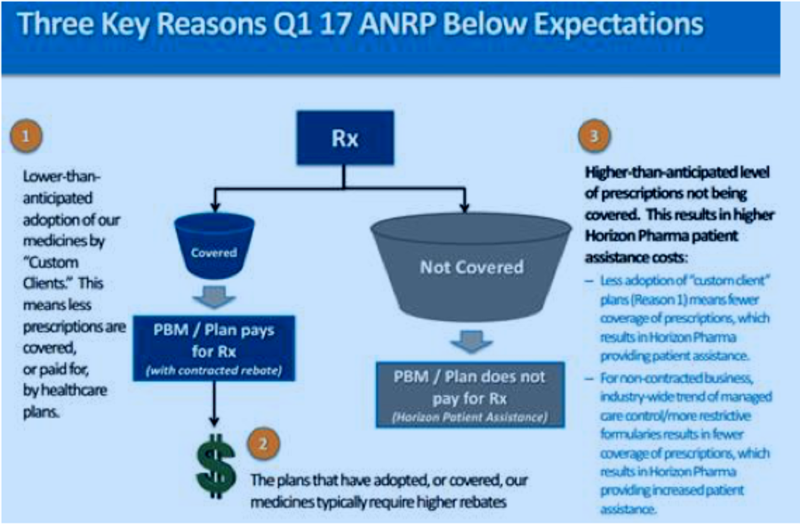 Horizon’s Quarterly Report openly acknowledges that Horizon offered increased “rebates” to PBMs to ensure PBMs would include the drugs on their “standard” Formularies in 2017. First, the increased “rebates” that Horizon is paying to PBMs almost certainly include increased “other monies” that PBMs retain for themselves. Don’t forget – as we’ve previously explained, as long as PBMs label the monies that Horizon pays to the PBMs with a label other than “rebates”, PBMs can get rich making their secret “deals” with Horizon (and with other manufacturers as well, since PBMs pursue the same tactics with other manufacturers too). Second, as we’ve also previously described, the additional “rebates” that PBMs collect for these drugs enable PBMs to offer higher “rebates” to existing clients and new potential clients, duping both into thinking that the PBMs are reducing client costs (which the PBMs are obviously not doing). Unfortunately, almost all PBMs are currently retaining their existing clients – and winning new clients – based on PBMs’ promises of far higher rebates, which often are obtained by covering drugs like Vimovo, Duexis and Pennsaid that increase clients costs, rather than decreasing them. Third, Horizon openly stated in its First Quarter Report that its “strategy” is to pay PBMs increased monies to gain Formulary access, and had Horizon and PBMs not entered into these contracts, “long term, [Horizon] would be in a negative position.” Translation? PBMs’ secret “deals” with Horizon enabled it to generate profits from these outrageously priced drugs, and had PBMs refused to enter into their secret “deals” with Horizon, PBMs could have dramatically impacted Horizon’s financial situation (and perhaps forced Horizon to lower its prices to obtain sales). * Plans that created customized Formularies decreased the purchases of the 3 drugs more than Horizon projected. Lucky for Plans that use customized Formularies! * The above resulted in more beneficiaries of customized Plans taking advantage of Horizon’s “free” drugs dispensed through Horizon’s patient assistance programs. Again – Lucky for Plans that use customized Formularies! * Plans that rely on PBMs’ standard Formularies used the 3 drugs more than Horizon projected. Too bad for those Plans – They obviously incurred absurdly high costs for entirely unnecessary drugs! And this resulted in Horizon’s “mix” of customized vs. standard Formularies skewing toward standard Formularies more than Horizon expected, resulting in Horizon paying out more “rebates” than it had projected. The question is: What happened to your Plan’s total costs for these 3 drugs during this period? If your costs weren’t entirely eliminated, you were likely the victim of relying on your PBM to decide which drugs to cover, and relying on your PBM’s standard Formulary rather than customizing your own Formulary. So What Should Your Plan Do? Short term: If your Plan is still covering these 3 drugs, you should stop covering all 3 immediately. None of these drugs is necessary. All are ridiculously priced. And given Horizon’s past practices – and its poor First Quarter 2017 performance – Horizon may increase the prices of all 3 drugs yet again in the near future. Moreover, manufacturers that inflate their prices for unnecessary drugs – and relentlessly raise their prices – should feel the sting of lost business. Note, too, there are about two dozen other drugs that you should also stop covering immediately. We’ve previously described likely targets, but each Plan should undertake its own “high-to-low cost analysis” of its own claims data to determine which drugs it should exclude. We routinely conduct such analyses for a few thousand dollars. Depending on their size, our clients typically save hundreds of thousands of dollars – or millions – from what they learn. Therefore, there’s no excuse for not conducting such an analysis. When you stop covering these 3 drugs (and any others you might no longer cover), we warn you “Beware!” Based on our firm’s review of hundreds of PBM-client contracts, your PBM contract undoubtedly allows your PBM to decrease its “rebate” payments as much as your PBM wants. And when it does, your PBM may reduce your total rebates by more than the “rebates” it was actually passing through to your Plan for the drugs you are no longer covering. That’s especially true, because your PBM may lose the “extra revenues” it was earning from its secret “deals” (through monies that your PBM retained because it labeled the monies something other than “rebates”). What can you do to prevent your PBM from unfairly decreasing your rebates? Even if your PBM contract does not provide you with the right to obtain information about drug-by-drug rebates, you should insist that your PBM disclose how much in rebates your PBM was collecting and passing through to your Plan for these 3 drugs. After all, on what equitable basis could your PBM be allowed to reduce your rebates inequitably, and keep you from knowing it is doing so? Under the law, there’s a concept of an “accounting”. Get an “accounting” from your PBM! Also, your next PBM contract should require your PBM to pass through all monies (not just rebates) from all third parties (not just manufacturers). This will decrease your PBM’s incentives to enter into secret “deals” with manufacturers and other third parties that are against your Plan’s interests. It will also increase your savings. Finally, your next PBM contract should also require your PBM to provide detailed evidence of any rebate reduction it attempts to impose, should it claim such a reduction is required. And no rebate reduction should be allowed, unless the PBM provides the requisite evidence. The contracts that our consulting firm puts in place through PBM RFPs for our clients contain all the above-described terms, as does our contract for the National Prescription Coverage Coalition. If we can obtain these protections for our clients and dramatically reduce our clients’ costs as a result, your Plan can obviously obtain these provisions as well. To review other Rx Drug Alerts, go to the Menu Bar and click on Rx Alerts. Plans’ costs for these drugs will vary, depending on several variables, including the terms of their PBM contract and which pharmacies their beneficiaries most use. The approximate costs that we state are based on a review of extensive claims data, and a calculation based on 2 pills per day, which is how these drugs are almost always prescribed and dispensed. Caremark stopped covering all 3 drugs in its 2015 “standard” Formulary and continued to exclude all 3 drugs in 2016. Express Scripts dropped coverage of Vimovo and Duexis in its 2015 “standard” Formulary and continued to exclude both drugs in 2016. See Thomson Reuters FINAL TRANSCRIPT Q1 2017 Horizon Pharma PLC Earnings Call: Event Date/Time: 05/08/2017 07:30 AM GMT at page 11.